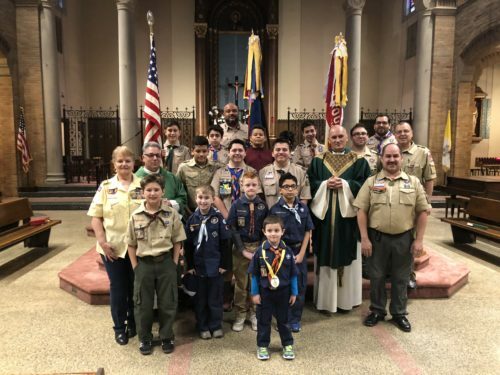 Boys Scouts, Cub Scouts and Girls Scouts celebrated Scout Sunday at Our Lady of Mercy parish, Forest Hills. Religious awards and emblems were distributed to support the spiritual development of the boys and girls. Matthew Stalzer was presented the Light of Christ Award and Brandon Nguyen received the Parvuli Dei Award. Katherine Boselli and Jana Hippeli from Girl Scouts Troop #4587 presented the parish with two drawings that were placed by the food bins in the church to mark the completion for their project to bring more awareness to the plight of the hungry and less fortunate in our community.